It’s early in the morning and we are standing on the Poonhill and are gazing at the mountain range which is slowly emerging in the first light of dawn. 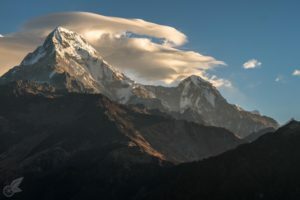 The Annapurna I reveals itself – it is the highest of the four Annapurnas with 8091m which we have seen during our trek around the mountain massif. The Annapurna South is closer to us and because of that it seems much bigger and more impressive despite its peak being only at a height of 7219m. Nearby is Dhaulagiri (8167m) which had been thought to be the highest mountain of the world for several decades. The sun now starts to beam at the highest peaks and we enjoy the view and peaceful moment. It is the last day of our trek in this area and so we reflect on what had happened during the last 16 days – beautiful moments, experiences and encounters. In Pokhara we were able to leave our bicycles and most of our luggage and were therefore trekking with as little as possible which made our hike a lot easier. Starting in the little town of Besi Sahar, which we had reached after a bus ride of 5 hours, we had also reached a long anticipated milestone. Finally we had “really” arrived in Nepal and were about to start the trek we had been looking forward to since before we even started in Germany. The only remaining element of uncertainty was the fact that it was already December and we hoped that we were still able to hike the whole Circuit. Roughly midway through the trek a 5400m high pass awaited us and we were hoping that we would not be caught in a snowy winter that would close the pass and that we would be able to acclimatize to the high altitude. The first days we passed through the lush and green foothills of the Himalayas. Especially then it was quite warm during the day but significantly colder during the night. Most days clouds were trapped in the deep valleys and the air seemed foggy and prevented a clear mountain view. Aside from our offline navigation we had also brought a paper map and on it we found marks indicating hot springs at different spots. Also the map showed us alternative trails as the construction of a road up the valley has affected the former hiking trail. 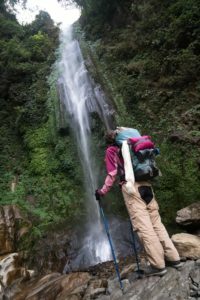 On our second day we followed such an alternative trail which turned out to be beautiful but also very strenuous as it was full of steep climbs and descents. Our destination for the day was a village called Jagat and the hot springs nearby. 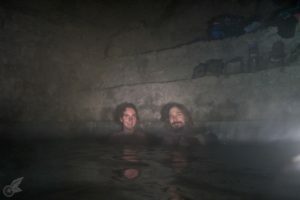 We were not dissapointed: the hot springs seemed to be frequented mostly by locals and came with two pools made of concrete and a shelter. We could mix the very hot water with cold water from the river to our liking and then leaned back and enjoyed the paradise-like evening. To enjoy even more hot springs we had to hike for another two days. In Chame we were able to rent a room right next to the pools and didn’t have to hike down to them like in Jagat. Bit by bit the lush green, bamboo plants and leafy trees gave way to rocks and cone trees. Every day we hiked further up into the Himalayan mountains. Not only the vegetation but also the culture around us changed from Hinduism to Tibetan Buddhism the further up we were. Visible signs of that were chorten, colourful prayer flags and prayer mills in the villages. Additionally it grew a bit colder every day and especially at night. The air got thinner and so we rested in Manang (3500m) for a day in the hope of acclimatisating to the high altitude. Sami already had troubles sleeping at this altitude because he had the impression of not getting enough oxygen when he was trying to fall asleep. Each night he also woke up a few times because of this and had to open the door to let fresh air in. Laying on his back and breathing only through the mouth was necessary as well. Despite all that we still felt rested and energetic enough to attempt to hike up to the Tilicho Lake. 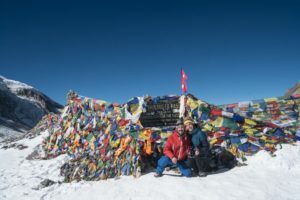 It is an addition of two or three days to the regular trek and would lead us to a viewpoint at 5200m. The Tilicho Base Camp is a little higher than 4100m and only accessible on foot through a valley and aside from the lake it also offered another opportunity to adjust to the high elevation. After a long but beautiful day of hiking we arrived at the base camp and wanted to rest a bit and enjoy the warm sun. But half an hour later I was suddenly shivering with cold and exhaustion. A little later a strong headache, nausea and even vomitting followed. We both knew that I must have problems with the altitude but were unsure of how serious the situation really was. We both thought of AMS (Acute Mountain Sickness) and that it can be life-threatening and that in such a case the only solution would be to descend. Sami tried to get help and asked both the cook of the base camp and some local guides, but unfortunately he only gained pitiful looks and unhelpful comments – clearly they thought that we were stupid and inexperienced tourists who should have hired a “professional” – instead of real support. When Sami did not give up he was at least able to get some information, although still not very helpful. As a result we knew that we were stuck at the Base Camp until the next morning as there were no horses we could hire to get out of the valley and even the last resort option of helicopter rescue was not available, not even a working landline telephone. We were very surprised because we would have thought that such an infrastructure would exist in a place that is so overrun by tourists as the Annapurna Circuit. Luckily I got better when Sami buried me with both our sleeping bags and some blankets and force-fed me a lot of tea and hot soups. The next morning I even felt well again and it all seemed like a bad nightmare – one we were both happy that it had passed without any long-lasting damage. In the days after we climbed further up and finally over the Thorung-La Pass, the highest point of the Circuit. The cone trees now gave way to bare or snow-clad rocks and the view into the valley behind us was once again beautiful and spectacular. We have met different other trekkers on the way and ended up hiking with some of them for a while until destinations and paths separated again. Although we both get along with each other extremely well and enjoy being with each other even constantly it was still nice to meet other travellers and have conversations with them. It was wonderful to share and to support each other. Particularly the day when we crossed the pass was long and strenuous for all of us. The high altitude made it difficult as well. When we were already on the way we met a Chinese trekker who obviously had a very hard time and was all alone. After some persuasion we could take his backpack and pass it around among our group and with supporting him we all made it across the pass well and happy. 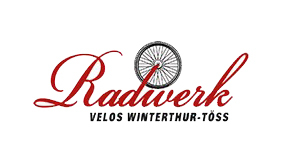 We’d like to thank everybody for this experience of support and for the wonderful time we’ve had! Even though we had not expected it the pass truly turned out to be the highlight of the Circuit. The second half of the trek after the Thorung-La was much more quiet and seemed to have a lot less trekkers hiking it. Even the locals we met in the villages seemed much more open and curious again and were happily greeting us. The vegetation was first much dryer and more sparse but changed into the familiar lush green when we descended further. The final stage of the trek was a long ascent up to the Poonhill. The closer we came to our destination the more crowded it became and we realised that this “short” trek was very accessible from Pokhara and therefore an attractive hike to get a glimpse of the mighty Annapurna Massif. Before dawn everybody hiked the last bit up to the peak and we were not disappointed. Another beautiful day dawned with amazing views and sunshine. It was a fitting end to an amazing trek around the Annapurnas.